We are pleased to present unreachable is just close enough on the occasion of the fifth anniversary of the founding of Galerie Alexandra Saheb. The exhibition will be the last in the Linienstrasse before we move to our new location - Auguststrasse 91 - in September 2009. As a positive gesture in the face of economic crisis, fourteen artists have been invited to present works in the old space on the theme of lightness. The result is an exhibition that includes works in new media, painting, sculpture, photography, installation and video. The variety of the artistic approaches in this first anniversary exhibition offers a particularly clear reflections of the gallery's focus: to present artistic interventions enabling new visual experiences - ranging from visibility to disappearance, illusion and evocative reality. 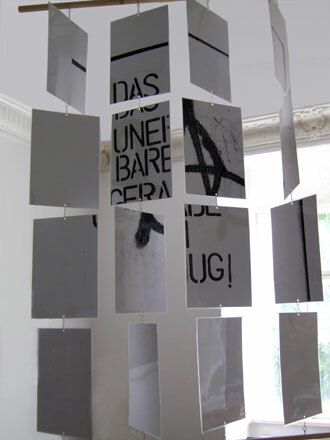 The title of the exhibition refers to the installation by Thomas Seidemann, a sixteen-part mobile incorporating text and graffiti. The exhibited works convey a sense of lightness in their attitude and gesture - also in their structure and material and use of time, history and fiction. Memory and falsification are the artists' thematic points of departure.